This blog was conceived as a place to shed some light onto the lies that are spread by those who seek to push us back into the closet. It was conceived as a place to be used for healing as well. I wanted to include all of our alphabet soup. Right now we are seeing some amazing accomplishments for our civil rights, for marriage in Iowa, Vermont, Connecticut, Massachusetts, and I am waiting today to hear if the Nevada Assembly will override our 'governors' veto for our own domestic partnership bill. The Senate did so last night. At least one Senator who had voted against the bill originally reversed his vote due to the calls he received from the Anti-Gay "Christians" threatening to do him harm if he voted to overturn the veto. Love wins over hate. In Florida, their Appellate Court overturned the ban on gay adoption. Arkansas is looking at their anti adoption law. More and more states are passing laws to protect us in our places of employment, our homes and with the passage of the Matthew Shepard Act, there is great hope that the free license so many haters feel they have to beat, maim and kill us will be curbed. Corporations are moving to include sexual orientation AND even gender identity as protected from discriminatory hiring and firing practices. Love wins over hate. From the time I was about 8, when my grandfather paid me 10.00 (1960's money) to read the Declaration of Independence, the Constitution and explain my understanding of them, AND to memorize the first 10 amendments, I have believed with all my heart and soul that ALL are created EQUAL and ALL have unalienable rights to life, liberty and the pursuit of happiness. I have believed that while we have the potential to be the greatest country in the world we often fall short. BUT I have come to notice that it has ALWAYS been the oppressed and downtrodden that have shaken our complacency to the roots and have FORCED US TO LIVE UP TO OUR FOUNDING IDEALS. It has been the Blacks brought in slave ships against their will, who survived untold horrors to somehow remain sane, to raise families and to find love, education, to finally demand from this country the rights they as humans were already guaranteed. It too has been the Women who knew those rights belonged to them, the original peoples of the many tribes, because they also, from birth, were endowed with the same guarantees, it has been the Asians, the Irish and the millions who have come here from every corner of the globe because they believe in those ideals sometimes more than we do who were born here. I remember that during the civil rights movement of the 1960's there were opposing voices from some black leaders. They felt that Dr. King was causing trouble. That the whites would listen better if Malcolm X would shut up and move out of the limelight. We could have full equality if you just don't include the Nation of Islam. Or the Black Panthers. I remember those who opposed Muhammad Ali when he gave the Black Power sign at the Olympics. Don't protest they said. Don't say that they said. "They" will come after us, they said, there will be more lynchings, more beatings, more cross burnings if you keep that up Dr. King. I hear the same voices in our community today. If we would only ignore the Transgender community we will have full rights already. If we mock the Bisexuals, call them "posers", "confused" the Anti-Gays wouldn't have so much ammunition against us. If those gay men would quit holding hands in public, if those lesbians would stop acting so dyke, if we would just shut the hell up so they don't get mad anymore and beat us and kill us and call us names.............If, if, if.........what you are really saying is: IF we only discriminate against those who we see as making it harder on the rest of us and embarrass us WE WOULD HAVE OUR FULL RIGHTS ALREADY!!! Hate produces hate, even within our own community. We WILL only then be the haters and the discriminators and oppressors. Just as hate produces hate everywhere it has produced it in some of us. The daily hypocrisy of the Anti-Gay Industry has ceased to shock me. It does however feed this feeling within me that right now is the time we all lay down our differences of opinion and claim our human rights that as American citizens, we already have. Each of us need to believe that these truths do indeed apply to us just as they apply to every human being; "We hold these truths to be self-evident, that all men are created equal, that they are endowed by their Creator with certain unalienable Rights, that among these are Life, Liberty and the pursuit of Happiness." Is not marriage the pursuit of Happiness? Is not a job, a decent home and the knowledge that our persons will not be attacked simply for how we were created? Is it not also for our children's security and happiness that we wish our relationships to be legalized? What concept of full civil rights are parts of our family not understanding? How can we accept that any one of our family be thrown under the bus? Some have the opinion that if we get marriage first, it will make us seem less different. Some think the repeal of DOMA is the first step. Others want the repeal of "don't ask, don't tell." Some feel if we could just not have to worry about the "trans-folk" or confusing "bi's" we would get everything we ask for. When one is talking about human rights we should not cut it up just to make it easier for the oppressors to swallow. What message are we sending? That they, maybe, just maybe have the right to keep on oppressing us as long as we are able to take what crumbs are offered? Oh, I know how things get done in politics, we compromise, we cajole and we plead. With the vitriol spewing from the far right and the Anti Gay increasing, we need to be coming together like no group before us. And realize that if/when Prop H8 is overturned it will only increase. We need to take a unified, forceful stand now, at this time. If there ever was a time for an oppressed group to demand full and complete equality with no one thrown under the bus, it is this time, here and now. No more compromise, no more empty promises, simply FULL equality. I think we need to let the Equality Summit, HRC, GLAAD, Join the Impact and all our allies know that this is what needs to become the first, the only and the actual "Gay Agenda." There is something like this now, it is called The Dallas Principles. I am excited and cautious at the same time. I am excited because with those of us who are grassroots and not penthouse, it is a place to start. I am cautious because it is headed up by some the same folks who sometimes in the past have wanted to toss some of us under the bus. Who attend cocktail parties for equality and served under the Clinton administration who did more damage to our rights than many of us will admit. Maybe they have learned, maybe they are trying. I myself have signed the Principles. I believe those words they have written. I intend to be one who HOLDS THEM TO IT. Rebecca - I could not agree more! It's called LGBT for a reason. Each person matters. 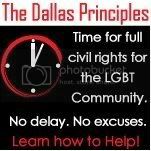 I signed the Dallas Principles too. Good for you, LETS hold them to it! Thanks for all you did to make this project successful.